Sculpture in Stone (MFA), no. 226. Most of the little toe is missing. The sides of the plinth (4.7 cm thick) are broken off except at the front and the inner side of the foot. These preserved edges show it was of irregular shape. To the right of the heel is a piece of marble projecting upward from the surface of the plinth; in front of this projection are the remains of a large dowel hole. 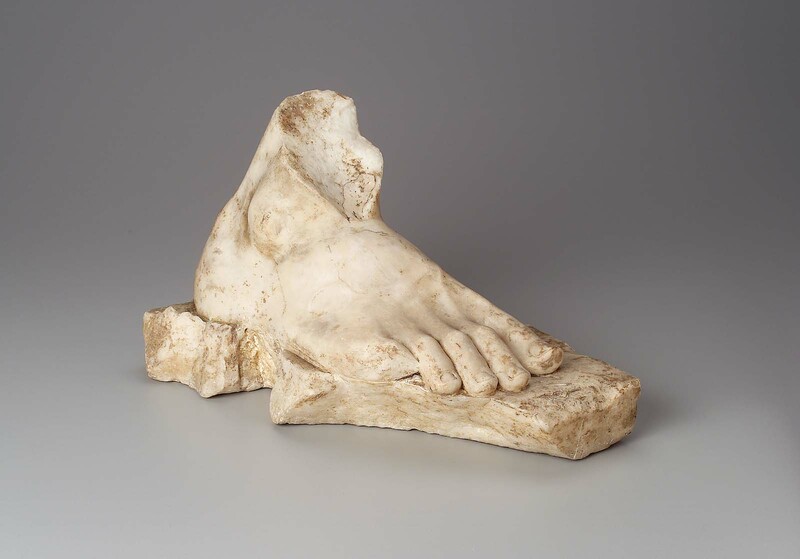 The shape of the plinth and the foot’s position show that the figure was represented in action, with the right foot advanced, the lower leg inclined outward and strongly bent at the knee. Some object is to be restored at the right side.